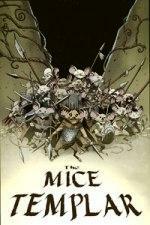 The Mice Templar, issues 1 and 2, published by Image Comics, Inc., 32 pages, $2.99. So, there’s this new comic called The Mice Templar, co-written by Michael Avon Oeming and Bryan J.L. Glass, with art by Oeming. It’s about a bunch of..., well, mice. If you’re not a fan of “funny animal” comics, however, don’t worry - there’s nothing funny, here. There is, however, a compelling story to be found. Mice is ultimately about Karic, a youngster who has yet to discover that he has a great destiny. Karic is enchanted with the legend of an “ancient warrior-priest” called Kuhl-En and “The Templar,” a group of warriors who fought for truth, justice and..., ah, you get the idea. Initially discouraged by adults from listening to Templar-inspired stories and having imagined adventures as a Templar warrior himself, Karic finds himself the victim of deadly circumstances beyond his control, desperately hoping that the stories of a warrior-caste which offers hope to those in need are true. Glass and Oeming created The-Mice-Templar, and fortunately for readers, they have done more than simply spawn a serviceable concept for a new comic; they also offer intriguing characterization, an exciting plot, gripping action sequences and powerful emotionality to readers wise enough to give this yarn a try. I mean, let’s face it, when you find the ol’ heartstrings being plucked by cartoon mice, someone’s doing something right! Oeming’s art work brings the characters to life in a way that endears them to the reader, then surprises them with the ferocity of which they are capable. Visually, the book is just as dramatic and emotionally charged as the script. And, while you may have to work a bit at telling the characters apart in the beginning, they quickly distinguish themselves with their individual personality traits, characteristics and quirks. The Mice Templar is recommended for all but the youngest readers, as there is some intense violence and disturbing imagery. Find it at comics shops and online retailers and auctions.